ThamCheeWah | All you need is this one thought to move mountains, what is it? More than thirty years ago, his family was poor, even having a proper meal was difficult. Alfred decided to make it big. One way is to become the boss of his own company. He knew then he had to acquire a skill. He took his uncle’s advice and became a car mechanic. After a short stint at repairing automobile, he decided that it was not what he wanted to do. Then, he joined an interior design firm that specialised in making bespoke furniture. He learned fast, within three years, he learned to design and create furnitures according to customers’ requirements. He became one of the company's youngest craftsman. Working under employment was easy, managing a business is something else. He realised that when he finally started his own business. He was so busy solving problems that at the end of the day, he was making even less money then when he was under employment. Learning to juggle so many challenges, from administration to manufacturing, from HR to marketing, from finance to sales, he decided there is only one thing he needed - education. He was determined to learn more about business management. With his determination to learn, he mastered the creation of the most sought after furniture discerning customers are looking for - the Chesterfield sofas. The distinctive features of a classic Chesterfield settee has its characteristic deep buttoned, quilted leather upholstery and low seat base. The purpose of the low seat base is believed to be the idea from a Lord Philip Stanhope, the 4th Earl of Chesterfield (1694-1773). The Earl wanted a seat for a gentleman to sit upright without wrinkling his garment. 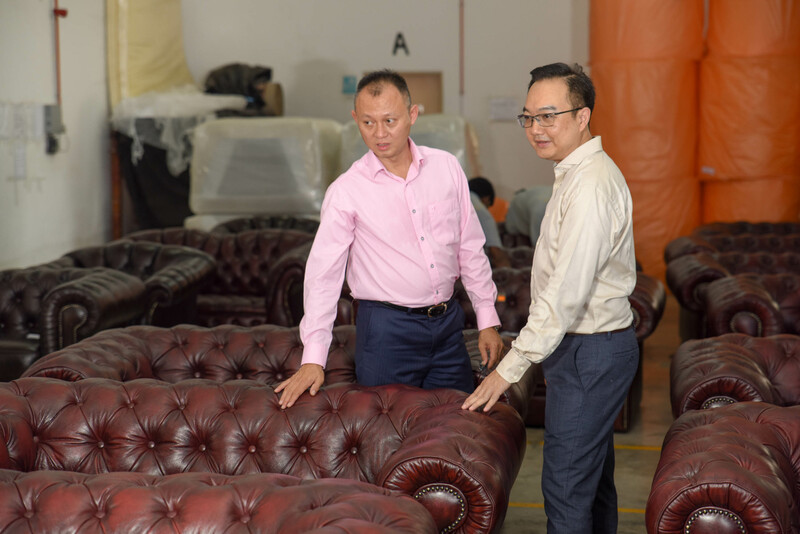 “We are a Malaysian-based OEM company shipping Chesterfield sofas to over twenty countries. As of today, we have manufactured and shipped over 180,000 sets of Chesterfield sofas worldwide,” Alfred said it with pride. Chesterfield leather sofa adds beauty and glamour to any elegantly designed room because of its unique washed down pigmented leather. The plush comfortable size and the vintage appeal add an aura of luxury and class to any room. Chesterfield sofas are accented with hand-tufted deep buttons for long term durability and comfort. “I strive to add value to everything I do. Even treating my staff, suppliers and everyone we work with, I want to add value to their lives,” Alfred explained about the value to bring to our work everyday. “When you go to work, think of ways to add value to your work. Challenge yourself to be a better person. Think about the glass of water you drink. Does a glass of water increase in value if say, after one year, it is still a glass of water? If you add in tea leaves, coffee and turn the water into something more valuable, wouldn't you willing to pay more for the cup of water which is now a latte or a lavender tea?” A good analogy indeed. “So, what are you adding into your glass of water?” Alfred asked. “If you are an excellent administrator in your company, and after one year, you are still a good administrator, why would I want to pay you more?” A good question to consider. 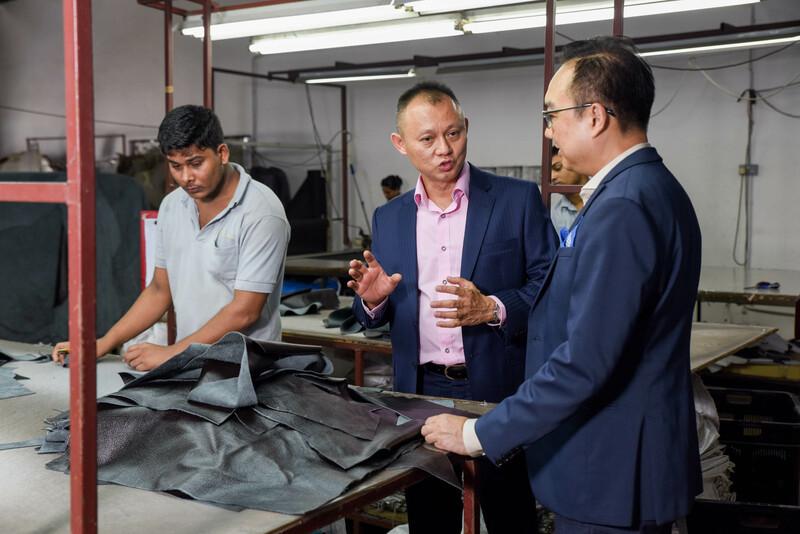 In Oct 2017, A & A Chesterfield has been recognised in the Malaysia Book of Records as Malaysia's "Largest Chesterfield Furniture Manufacturer". Alfred constantly strives to achieve new heights. Even as a Managing Director, he continues to attend workshops and put in extra effort to learn every aspect of business management. He learns about HR, finance, production and so much more. Finally, Alfred pushed himself to finish an MBA program mastering in management. DOWNLOAD FULL-COLOR PDF COPY HERE. Mydin's Managing Director - Datuk Wira (Dr) Haji Ameer Ali Mydin. Click here. The 6 Observations of Business Expansion Every Company Should Know. Click here.